- fire-feet scissor - pound the ball a couple of times, fire-feet (stutter), scissor, continue. 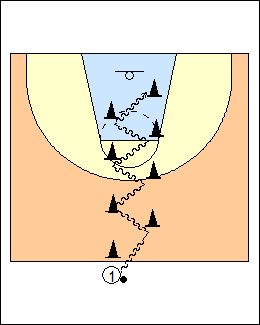 - behind the back at each cone (a v, not wrap) with a bounce in between. See Dribbling - Tauer stationary, Calipari warm-up, Speed course. - crossover hesitation - one of his favourite moves, e.g. crossover left to right (right foot and the ball hit at the same time), shift body weight left (jab left), keep going to the basket. 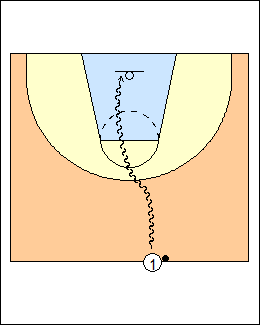 Counter - crossover, hesitation, through the legs. See Dribbling - Kevin O'Neill moves (crossover-jab, Nash dribble jab). 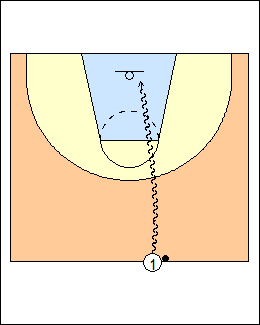 - killer crossover in-and-out - hesitation, scissor, in and out (defender thinks you are going to crossover). - scissor wrap - scissor, wrap behind the back. 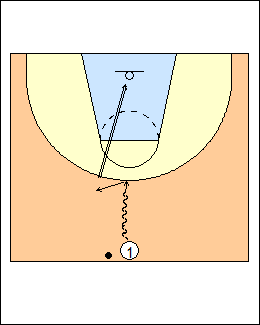 See Dribbling - Kevin O'Neill moves (hesitation dribble moves, Lebron James crossover, Deron Williams crossover). - progression - double crossover, shoot. As a defender tries to catch up when you attack the basket, wrap the ball back under your legs or behind your back for a jump shot (a drag stepback under the outside leg or behind the back). See Shooting - 5star in the box (Austin Rivers / Tyreke Evans stepback, drag stepbacks). Pro hop to avoid the defence or getting called for a charge, and to get a shot off or make a pass. 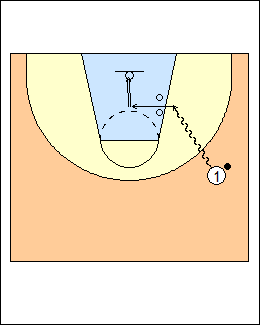 Attacking from the wing with the outside hand, pro hop middle (jump over cones on the lane line), land on two (a slice), you might have to fade away. If the defender's hands are low, go above his hands (over top); if his hands are high, you're low. Jamal Crawford - beats his man, gets to the help, switches hands (crossover), punches it one direction (behind the back dribble, or double behind the back), then hops back the other way, lands on two, taking the ball behind his back into a shot. Augie Johnston - go behind the back to finish if a defender reaches to steal the ball, a) regular layup, b) jump stop, c) Jamal Crawford - crossover, bring the ball behind the back, jump stop. See Dribbling - 5star triple b.